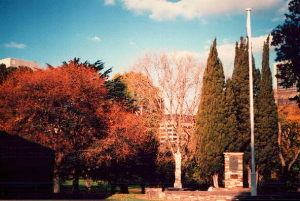 Melbourne's first public garden was established on the highest point of land in the Melbourne city and its flagstaff was once a vital orientation point for shipping. The flagstaff, erected in 1840 signalled (by flags) the first sighting of a vessel, its anchoring or any mishap. The introduction of the electric telegraph made the flagstaff obsolete in 1854. 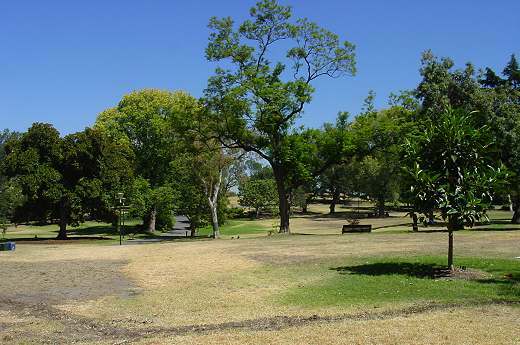 The original pines and gums were replaced in the 1880s with shade trees such as elms and oaks there today, although some of the old Moreton Bay Figs still survive. 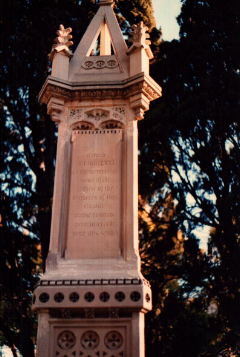 A memorial erected in 1870 reminds us that this is an old pioneer burial site. The koorie heritage was often ignored in the monuments and plaques raised by later settlers and their descendants. The another view walking trail positions markers at significant spots, often giving the other perspective of colonial claims (see: Another View walking trail). 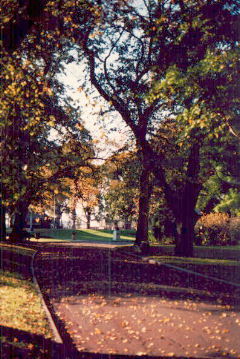 For a panorama which includes Flagstaff gardens, click here. click here for plaque commemorating Victoria's 100th anniversary. City Circle Tram, or any tram along La Trobe St going towards Spencer St. City Loop trains stop at Flagstaff Gardens Monday to Saturday. The City Circle trams pass Flagstaff Gardens on their route around the inner city. Flagstaff Station is closed all day Saturday, Sunday and public holidays.